When Regis McKenna wrote “Marketing is Everything” back in 1991, he was describing a situation where technology had advanced to a point that businesses were able to utilise it to serve customers in more ways than had ever been imagined before. This “Marketing is Everything” concept has developed over the years to refer to marketing in its fullest, proper sense as the intersection between the organisation and customer; all of the potential touch points the organisation can have with its customers or, indeed, entire ecosystem. So, whereas we often fall into the trap of thinking of marketing merely in terms of traditional marcomms (e.g. advertising and PR), it is really much broader than that. 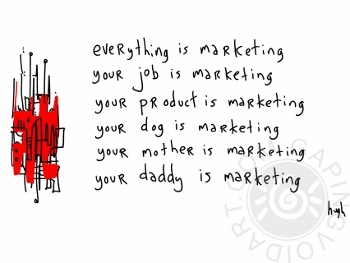 Marketing also should encompass things like: how our sales people behave; what our premises look like; how our customer service treats people; the content we produce; and (as Seth Godin reminds us) the quality of our products. 1. The company/customer relationship has flipped. Whereas previously organisations controlled the flow of the messages to suit themselves (the traditional role of marcomms), now it is the customers who control the conversation about and around organisations and it is up to the organisations to respond appropriately. 3. The transparency stakes are raised. Because customers are increasingly connected with each other through the social web, they are putting organisations under unprecedented levels of scrutiny. Historically, an organisation will have created a “brand identity” (the customer is number one, quality is our priority, etc) that it broadcast continually as part of its marketing messaging. However, if in the past it failed to live up to the ideals of that brand identity (by creating poor products, behaving unethically, or mistreating customers, for example), it was seldom caught out, or those misdeeds were seldom widely revealed. Now, however, any disconnect between an organisation’s stated brand identity and its behaviour is picked up and spread throughout the marketplace. Real transparency has been foisted upon us. The social era enhances and deepens the“marketing is everything” ethos. Now it’s up to your business and what should you do? Look inward. The first (and most difficult) thing to do is to take a close, honest look at your organisation to see if you are able withstand the scrutiny. Are you living up to the promises you are making to customers? Do your practices and products shine? If you can’t withstand the scrutiny, you need to address that. Quickly. You need to make sure that when people talk about your organisation they have positive things to say… about every facet. There is no “ignore social and maybe it won’t affect us” option. Welcome social media use. Open up to the social spaces. Break down walls between departments AND between employees and customers/suppliers/partners. Create a supportive culture. Allow, encourage, even require your employees to use social media. Give them training. Create social media guidelines document and procedures to help your employees navigate the social media waters. Are you embracing the scrutiny of the social era? With a background in marketing strategy, social media and mobile technologies, Eric helps our clients make meaningful sense of the brave new world where the customer controls the business ecosystem like never before.